On September 17, 2012, Operation Migration's Heather Ray wondered: "Crane #10-12 is almost the youngest crane we have this year, so why is she the whitest?" Indeed, she is even whiter than this year's oldest crane in the cohort,#4-12. Crane #10-12 is even getting her adult voice, while the others are still peeping. 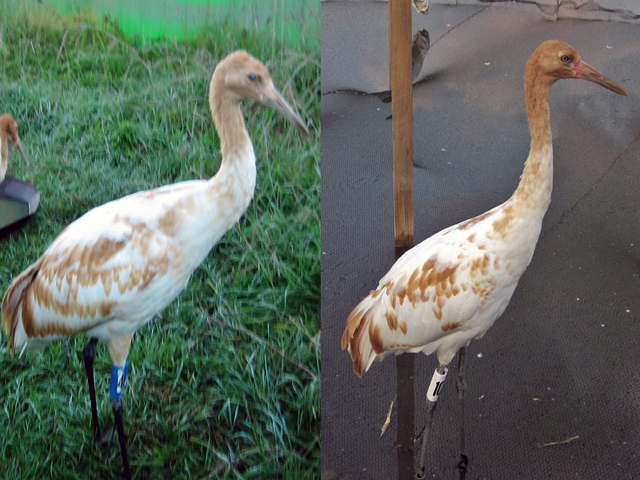 This side-by-side photo shows that there isn't much difference between cranes #4 and #10 in plumage color. Individual differences are found in cranes as often as in humans!